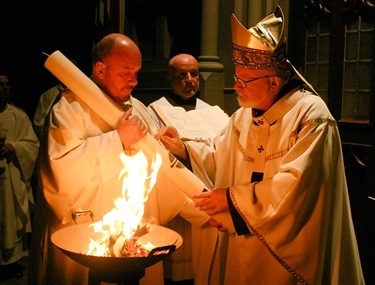 Last weekend, as you know, the Church celebrated the Easter Triduum — Holy Thursday, Good Friday and the Easter Vigil on Holy Saturday. 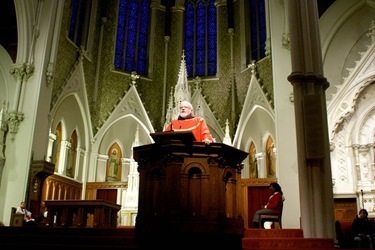 I led the services at our Cathedral, which were very well attended. 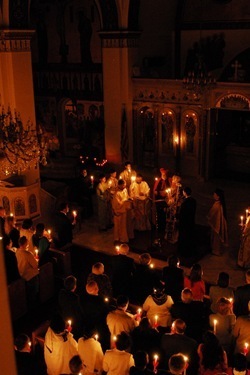 Holy Thursday is such a sacred day in the Christian calendar. It’s the day when Jesus bids farewell to his disciples and at the same time assures us he will be with us always through the Eucharist. 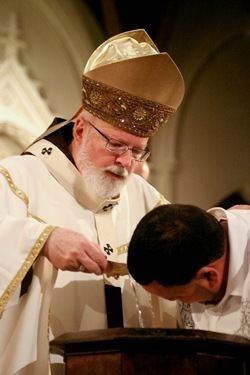 He also gives us the gift of the priesthood to be able to perpetuate the sacrament. 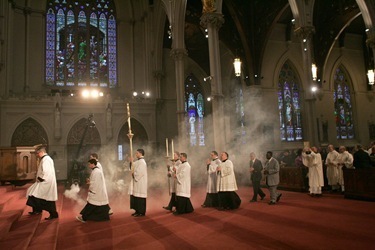 The celebration at the Cathedral is always a moving one. 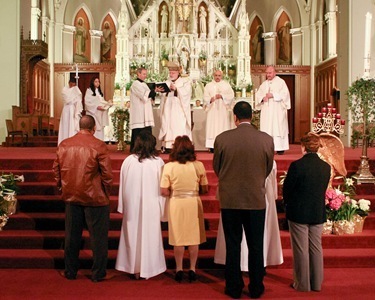 It’s always a bi-lingual celebration, we have one Eucharist bringing together the English and Spanish-speaking communities. 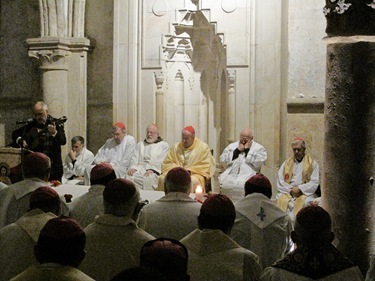 In my homily, I noted how it had been my great privilege to have recently celebrated the Eucharist at the Cenacle in Jerusalem, where the Last Supper was celebrated. 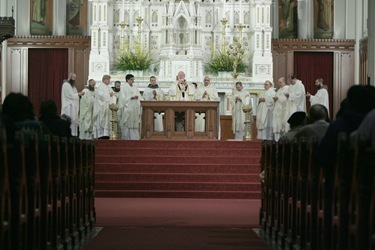 Mass concludes by taking the Sacrament to the repository. 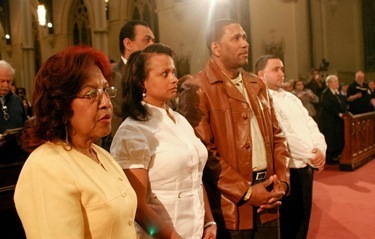 At our Mass, we had the joy of singing traditional Spanish Eucharistic hymns. 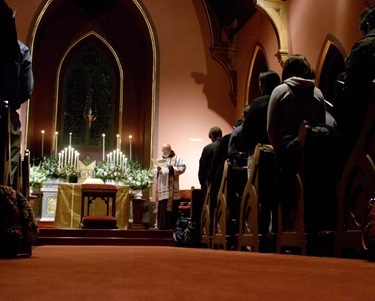 The vigil continued until midnight. 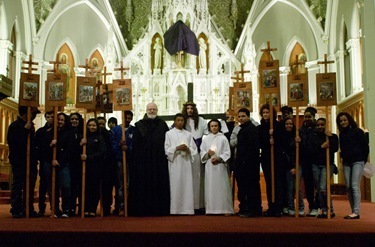 There were scores of students from Boston University who were with us during the vigil, as well as seminarians and others who were making the traditional visit to seven churches. During the last hour, the students sang songs of praise and we ended with Compline at midnight, fulfilling Jesus’ intention to watch and pray with him in the Garden of Gethsemane. 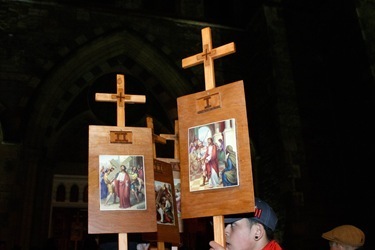 During the day on Friday, before the Good Friday liturgy, I received two groups at the Cathedral who were completing their respective Stations of the Cross processions. 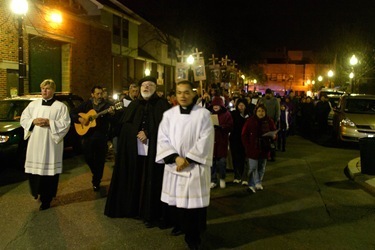 The first were a group of pro-life Catholics who were making a procession as a witness to the Gospel of Life and to prayerfully promote a respect for life. 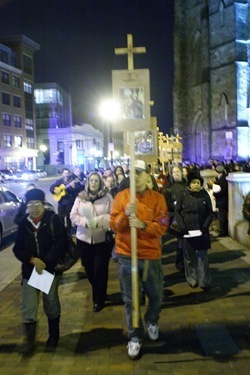 They were followed shortly thereafter by a group from Communion and Liberation. At 3 o’clock, we held the first of our Good Friday liturgies, which was in English. 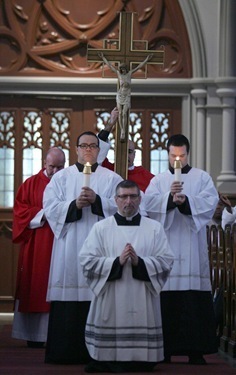 We brought out the Relic of the True Cross for veneration by the people during this service. 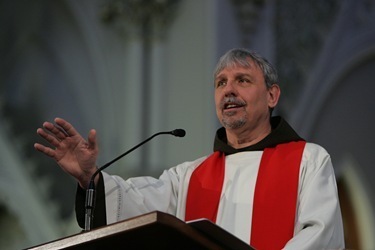 Father David Couturier preached a beautiful reflection. The choir members sang the Passion — and I always love when it is sung. 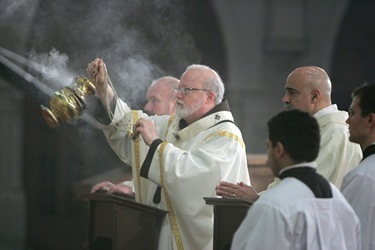 When I was a young friar, it was sung in Latin, and it was very beautiful. 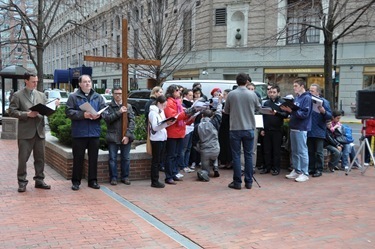 In fact, I had never heard it sung in the vernacular until I came to Boston, and I really enjoy it. 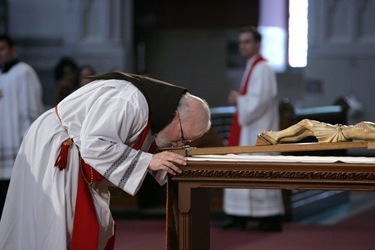 When Bishop Chris Coyne was here, he used to sing the Christus for us. He has a beautiful voice. Now, three members of the choir do it. The Passion consisted of three parts (the chorus, which is more commonly known as the narrator; the Christus, which is the words of Christ; and the Synagogus, which is the assembly). The choir took the synagogus. It was a very beautiful celebration. 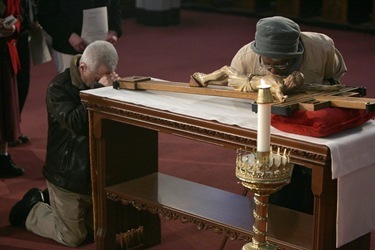 For those of you who could not be with us, I invite you to watch the videos of the Triduum liturgies available on the CatholicTV website. 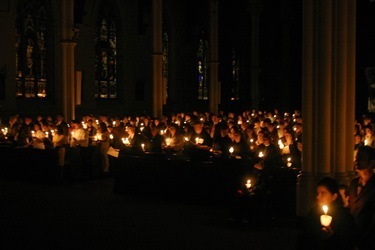 In the evening, we gathered with the Spanish community for a second Good Friday service. 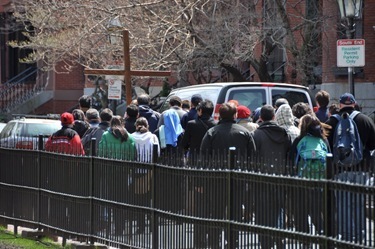 Afterward we do the Stations of the Cross going through the housing developments around the Cathedral, I was so pleased to see so many young people participate. 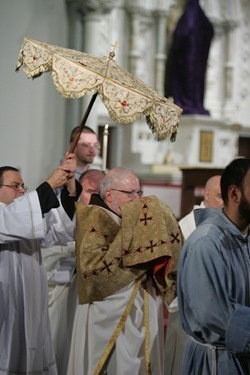 Gregory was dressed as Christ carrying the cross. 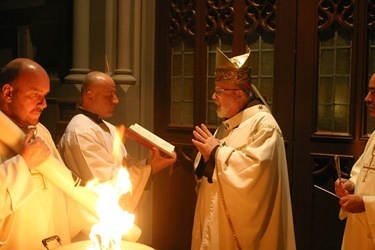 He was flanked by the altar servers, who were carrying candles. 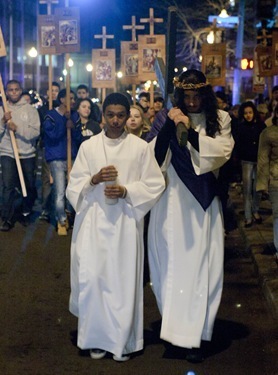 Each of the stations were being carried by a different member of the youth group. 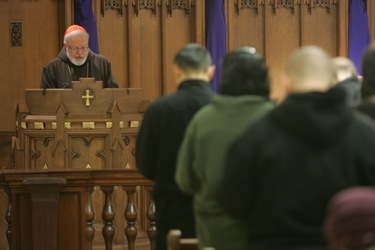 The stations were bi-lingual because a number of English parishioners joined us. We had a very large group. Saturday I went to lunch with Memores Domini, consecrated layman of the Communion and Liberation movement, who live at Sacred Heart in the North End. I was very happy to be with them. They gave me the world’s largest Easter egg! They also have a wonderful poster with John the Baptist pointing to Jesus the Lamb of God. 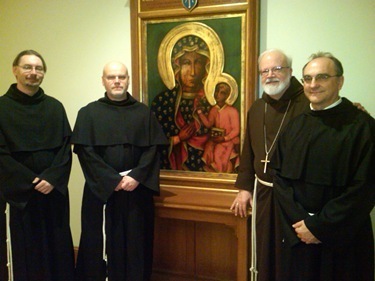 Also Saturday, I had a visit from Father Miroslaw Bartos, the provincial of the Warsaw province of the Conventual Franciscans. 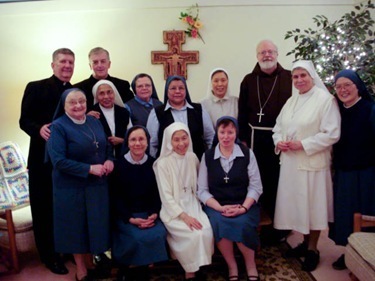 The province has friars working at Our Lady of Czestochowa Parish in Boston. 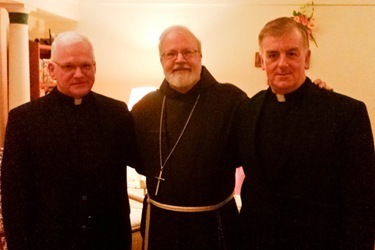 With him was Father Marek Iwamski from the province and Father Andrew Urbaniak, the pastor of Our Lady of Czestochowa. The provincial had never seen the Cathedral so I gave him a tour. 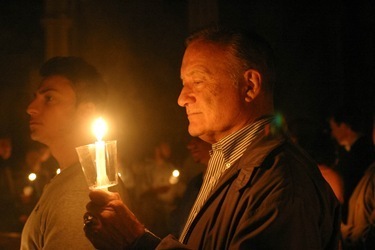 I proudly showed him our magnificent image of Our Lady of Czestochowa. 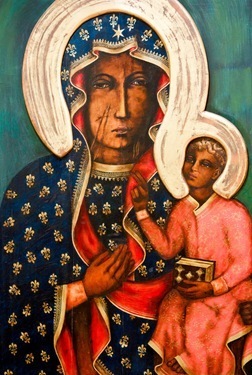 It is in Our Lady’s chapel where we have many different images of the Blessed Mother exhibited, but certainly one of the most beautiful is this one, which was a gift from a Polish bishop for the Cathedral. 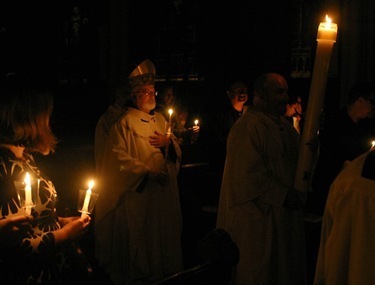 The Easter Vigil celebration was that night, and as always, it was a beautiful occasion. We received five people into the Church from the Hispanic community this year — two baptisms and three professions of faith. 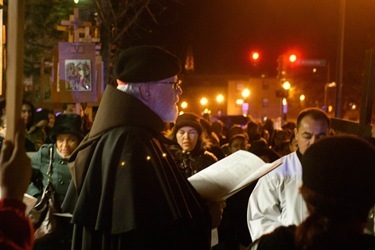 Father Jonathan Gaspar sang the Exultet, and did a wonderful job. The church was decorated beautifully. It was a very uplifting celebration. 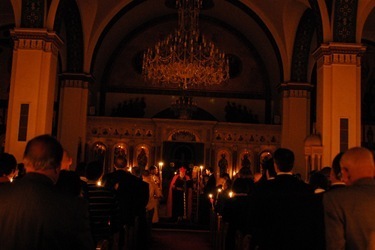 From there, I went to the Greek Orthodox community’s Easter Vigil liturgy. 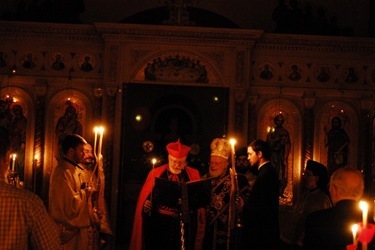 There, I read an Easter Gospel and gave a reflection, a greeting to the Greek Orthodox community. 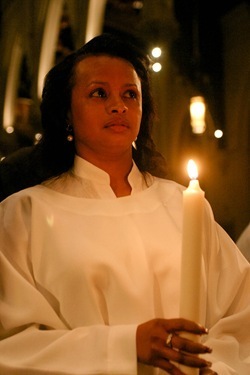 From there, I went to celebrate with the Ethiopian community at the Cathedral. 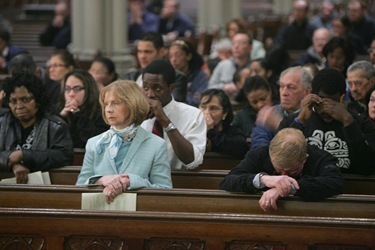 The next morning, I had the 11:30 Mass at the Cathedral, which was full. 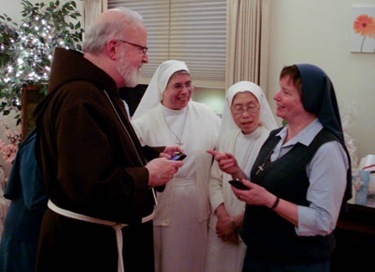 On Monday, I had vespers and dinner with the Sister Disciples of the Divine Master, who work at the Pastoral Center and Regina Cleri. who was visiting him from Prince Edward Island. 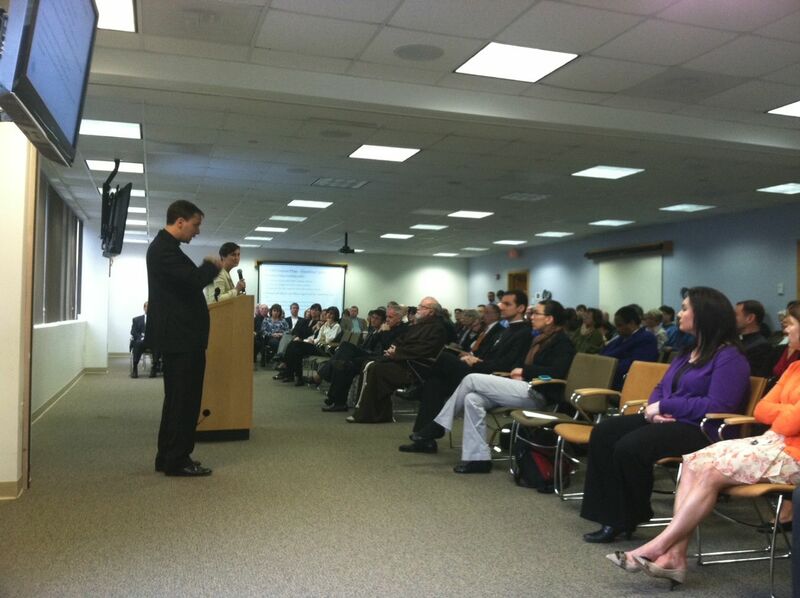 Periodically, I gather with my staff at the Pastoral Center, and this past Tuesday was one of those meetings. 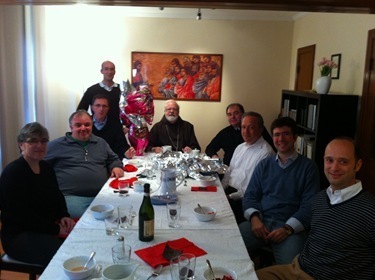 It gave me an opportunity to express our Easter best wishes and to thank all of them for the very hard work and dedication that makes the ministry of the Archdiocese possible. 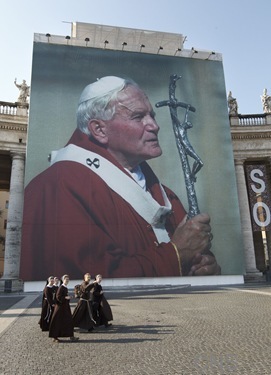 I leave you having recently arrived in Rome for some meetings and to participate in the beatification of Pope John Paul II, which will take place on Divine Mercy Sunday. I will share my thoughts and reflections on it in next week’s post, so be sure to tune in! Until then, peace be with you!